Edward Hopper v.s. Thomas Kinkade- Who's The Painter of Light ? One of the best reasons to look at art is it teaches us how to enjoy our eyes. Paintings are always lessons in seeing. Really good paintings simply help you have a lot more fun. Thomas Kinkade, probably one of the best known American artists and certainly one of the best marketed, passed away in the spring of 2012. Kinkade called himself "The Painter of Light", a slogan that had a certain ring to it. Kinkade's ubiquitous images are likely some of the first paintings most Americans were likely to have stumbled across. But if one keeps looking, there are probably other artists who have a great deal more to say to us about painting light with real authenticity. 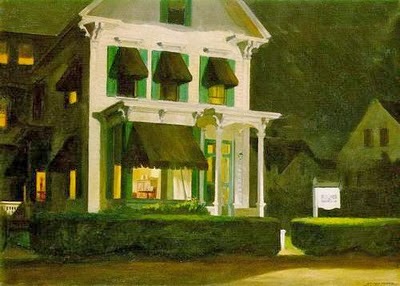 Longtime readers of this blog won't be surprised if I offer Edward Hopper as an alternative. Comparing the two landscapes above is revealing of some of the deeper essentials of painting. Winslow Homer, The Trapper, oil on canvas, 19 x 29 1/2", 1870, Colby College Museum of Art. This oil likely served as a preparatory canvas for the larger oil below. 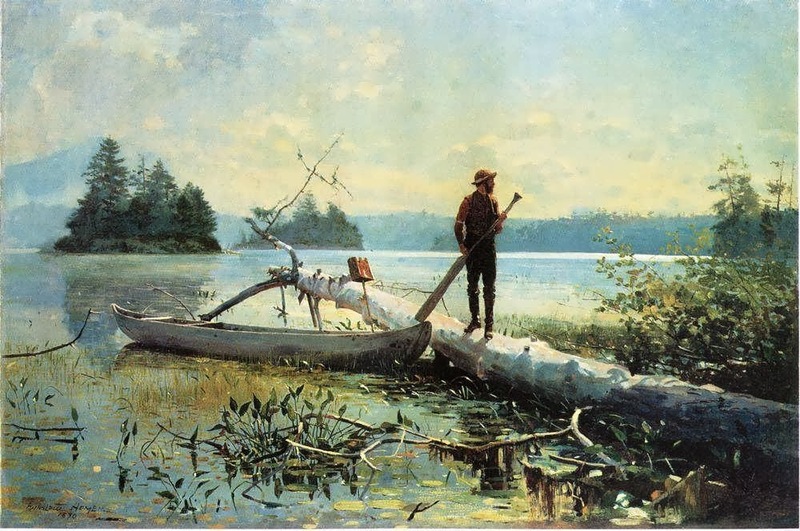 Winslow Homer, An Adirondack Lake, oil on canvas, 24 1/4 x 36 1/4", 1870, Henry Art Gallery, University of Washington, Seattle. featuringa detail from the Henry Art Gallery's version of Homer's painting. Which is More Important: Color or Drawing? My title asked a trick question. One for which there is no answer. To me there's more connection than separation between drawing and painting. 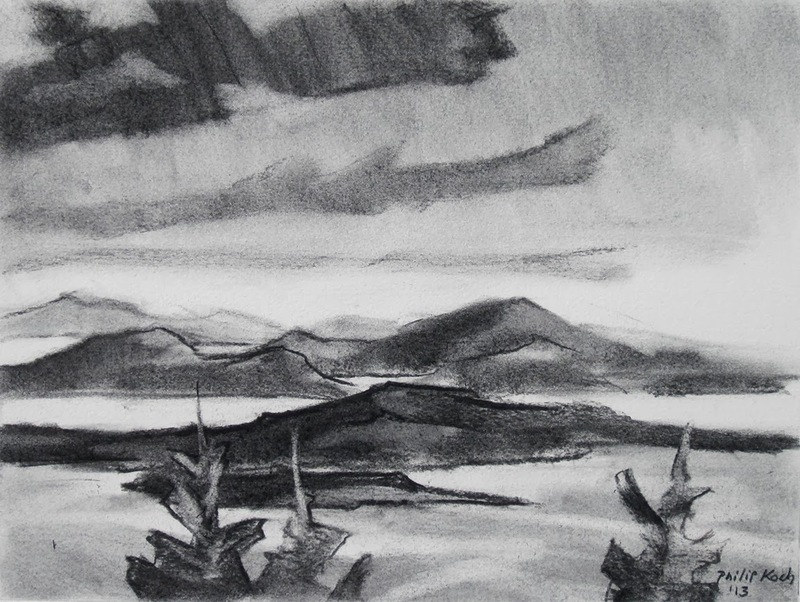 Drawing implies leaving a great deal of the surface of the paper exposed, while painting suggests covering over most or all of the ground of paper or canvas. I usually tell my painting students that "painting is mostly drawing," It is an exaggeration I know, but it does get their attention. The most magical thing about painting for me is of course color, as it is for most of us. But color is so powerfully fluid and multifaceted that it can easily elude us. A painting that is only about color would be like trying to get a drink in a parched desert without a cup. You need a vessel. Drawing in a great set of shapes "holds" the colors in place for your eyes to drink them in. 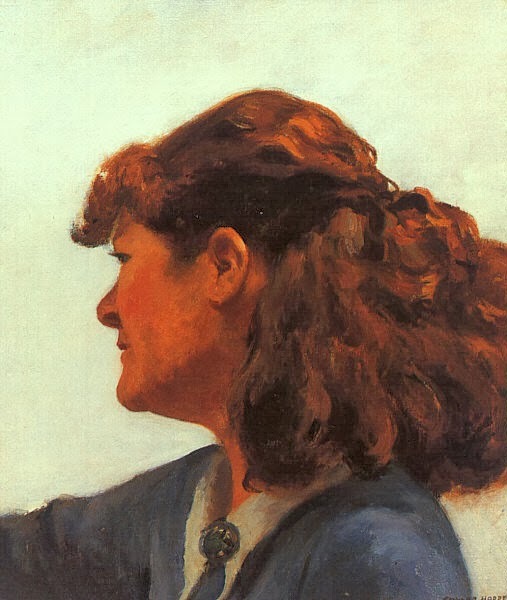 Above is an oil portrait of Jo Hopper painted by her husband Edward. I love its direct and concentrated energy and absolutely masterful design. As introverted and silent as Edward Hopper was, Jo was famously gregarious and scrappy. She had been an actress as well as an art student in her earlier days before marrying Edward. The two of them had a complicated decades long relationship, by turns closely intimate and other times explosive to the point of violence. It was Jo's initiative that really jump started Edward's rise to art stardom. Unfortunately her career as a painter lagged badly after her marriage, a source of long simmering resentment for her. 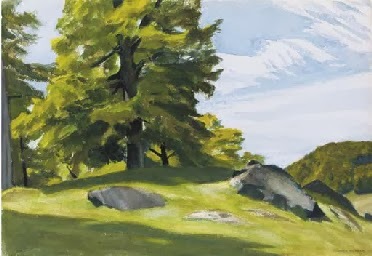 Two artists I look at a lot are Charles Burchfield and Edward Hopper. Their work intrigues and delights my eyes. But just as important studying their art has made me a far stronger painter. Unlike taciturn Hopper, Burchfield prodigiously kept journals throughout his life. His writing is often poetic and sometimes shows surprising candor. Burchfield recorded a dream he had about Hopper in his journal from July 28, 1947. (The two were friends, showing for years together at New York's Frank Rehn Galleries. Despite the major differences in their painting styles, each deeply respected the other's work). The Edward Hopper House Art Center in Nyack, NY has asked me to be part of the program at their Annual Spring Benefit on Sunday, May 4. There will be tours, music and sparkling wine. 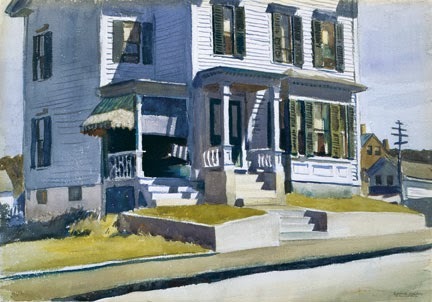 I'm going to give a short talk on Hopper's legacy and how he has influenced me and other artists since his time. The setting of Hopper House will do a lot of the talking for me.